Welcome to the e-learning lesson on Going Virtual: Online Tools for Project Management.In this lesson, you will be introduced to three web-based tools that will enhance your ability to collaborate with partners while managing projects, including Central Desktop, ProjectSpaces, and Basecamp.These tools are low-cost, web-based, and require no programming or advanced technical skill. Collaboration is imperative in project management. Project management is the methodical approach of planning, organizing, and managing resources to successfully reach specific project goals and objectives. Typically, project management involves many partners (some of whom may be working in remote locations), so collaboration via a web-based application is ideal. As you learn about these unique tools, keep in mind how you will collaborate with your volunteers, partners, or other individuals with whom you work to manage a project. Use project management tools for remote access, document management, tracking tasks, and capturing ideas. The first reason to use project management tools is remote access to files. With these tools, your documents are stored online. This means that you have access anytime and anywhere you have access to the Internet. This is especially important when you are working with partners who are either in another part of the country or travel frequently. The second reason is document management. As you upload edited versions of a document, these tools will keep the old versions for historic reference. Additionally, only one person can work on the document at a time. These features ensure that you do not waste time and effort, or create unnecessary steps to produce a polished document. The third reason to use online project management tools is to assist you in easily tracking tasks and milestones. For example, you can easily track or assign tasks for an upcoming conference, and get a quick progress check on the accomplishments to date to ensure you are prepared. Finally, online tools provide a single place to capture team discussions and ideas. These tools provide user-friendly forums for promoting team communication and the exchange of ideas. Additionally, these tools will keep a record of past discussions if a new team member joins or an idea resurfaces. The report card and the comparison table will help you compare and evaluate online tools for project management. The report card uses multiple factors to compare the various tools, including cost, security, level of skill required to setup and maintain, and key benefits and drawbacks. The comparison table includes information on core features, project coordination capabilities, and knowledge management capacity. CHAPTER 1: Central Desktop: An Online Tool Used to Collaborate and Manage Projects. Central Desktop is a great tool for project coordination and document management.It provides a variety of features, including project coordination through document management, task and milestone tracking, synchronized calendar functions, and progress reports. In general, the tool is fairly easy to set up and use. The cost may be a deterrent, but the capabilities provide a great deal of variety. The Central Desktop Dashboard provides an at-a-glance view of your projects. The homepage of a Central Desktop account is a personalized workspace, which includes a dashboard which is a compilation of items from all of your projects. The dashboard includes three main sections. The first is a list of links to all current projects, your company intranet, or other stored databases that you choose to include. The second section is a list of all overdue tasks and milestones across various projects. This list is automatically generated for any project you have entered into the system that remains incomplete. Finally, the last section is a list of impending events, tasks, and milestones, that are coming up in the next 10 days. The project homepage provides an overview of a specific project. The project homepage is where you can get a quick sense of how a specific project is going. Here you can make project-wide announcements to all team members, see a list of overdue tasks and milestones by team members, or see upcoming meetings. Also included is a recent activity section where you can see any new documents, resources, revisions to documents, or meeting cancellations. You can also see an at-a-glance list of who is a member of the project, so you can send emails or instant messages if they are online. You can also send invitations to a web meeting or Skype conference call. The "Files & Discussions" tab provides access to all of your project files. The “Files & Discussions” tab provides access to all of the project files. You can quickly access files through the search bar and tree structure of the files, which is similar to a Windows structure. Documents are displayed with multiple variables including title, status, modification date, or owner. Documents can be “checked out” to maintain version control, and all historical versions are stored for reference. Document version control is essential to any project management tool. When working with multiple partners, document version control is essential. There are many ways to handle version control including tracking comments, document status alerts, and storing historical versions. Specific types of documents should be used when multiple partners are working on the same documents. For Central Desktop these are known as “online” documents—which are like a wiki or editable webpage. With these online documents, you can choose to see a snapshot of all previous versions (including a percentage by which each version has changed); you can view versions side-by-side; or you can merge versions to view the changes. 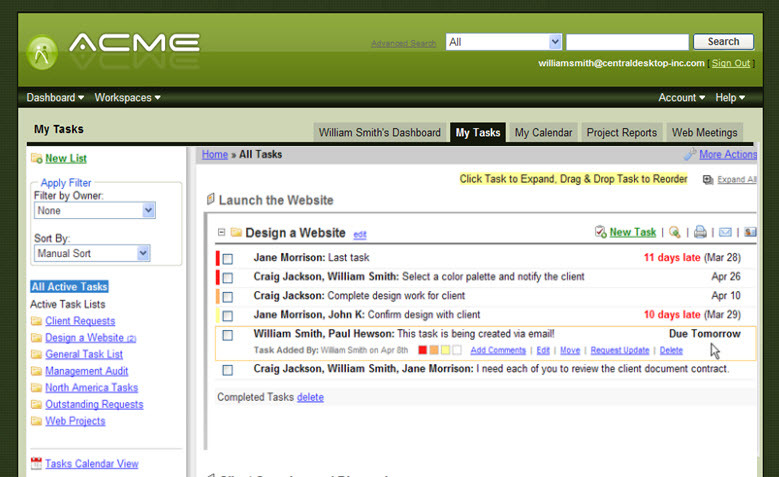 The "My Tasks" tab is a single source for access to all tasks associated with a project. The "My Tasks" tab allows you to create a task, organize tasks into folders, check tasks complete, attach tasks to milestones, and more. You can assign a new task to one or multiple people, notify assignees via email, make the task recurring, assign a due date, and set the priority. After a task is created, you can edit the task, move the task to a different milestone, request an update from the person that it is assigned to, add comments, or delete the task. "Milestones" allow you to track progress of several tasks at a glance. Within a project, there may be several milestones, and within each milestone, there are several tasks. You can assign responsibility for a milestone to a certain person and track the progress. Central Desktop will tell you how much of the milestone is complete based on how many of the tasks assigned to that milestone have been finished. This allows you to observe a larger picture of the progress versus looking through individual tasks. The "Calendar" and "Reports" tabs track several activities in a single location for easy review. Other Central Desktop features include "Calendar" and "Reports." The calendar view provides a visual representation of all the project activities. These are color coded for ease of use. It includes overdue tasks and milestones as well. Within the calendar, you can create a new event, email chosen recipients, and synchronize with Outlook. On the "Reports" tab, you can run several reports, print them out, and review them together as a team. The Project Status Report provides information about tasks and milestones. The Activity Log Report shows what your teams are doing in Central Desktop. The Login Report shows you who is logging in and how often. The Central Desktop resources highlight the friendly layout and functions. The Report Card has been created to help guide you in your decision-making process. The first element to consider is the cost, which depends on how many users, projects, and storage space you desire. Central Desktop earns a “high” rating for security, which means it’s an appropriate project management and storage tool for confidential materials. The tool’s administrative and user skill ratings are three stars and two stars, respectively. The administration skills are equal to someone who is comfortable posting content to websites like Facebook or LinkedIn. The user would only need to be comfortable surfing the web. The key benefits to Central Desktop are that each user gets a secure log-in, it’s easy to coordinate tasks and manage documents, and it’s easy to set up and begin using right away. However, a major drawback is how the cost increases as storage space increases. The comparison table includes information such as core features, project coordination capabilities, and knowledge management capacity. In addition to the many features you have already learned about, Central Desktop also has the capability to organize workflow processes and document approvals. Additionally, it allows users to post polls and conduct web meetings, which integrate nicely into the concept of project management as a whole. Access the Central Desktop website here. CHAPTER 2: ProjectSpaces: Another Tool for Online Collaboration and Project Management. CHAPTER 3: Basecamp: Another Project Management Tool Available Online.